Mangaluru, Aug 13, 2018: The Aati (Aashaada) month, the rainy season in Tulu Nadu, is well on the traditional path and a village setting. The heavy lashing rain provided a befitting backdrop for the Yakshagana artistes to perform in gusto. The mouth-watering dishes of the season only added to the popularity of the ‘Pilikula Aatida Koota,’ organised at the Traditional Guthu House in the Dr K Shivaram Karanth Pilikula Nisargadhama on August 12, Sunday. The organisers this year hosted Yakshagana by the Yaksha Manjusha team led by Vidya Kolyur. The team staged ‘Kamsa - Aasti Paasti’, a short sequence from the Jarasandha Vadha story. While Bhagawata (singer) Ravichandra Kannadikatte impressed with his singing, Akshay Marnad, Rakshit Shetty and Logesh Muchhoor got appreciation from the audience for their dance and presentation of the story. 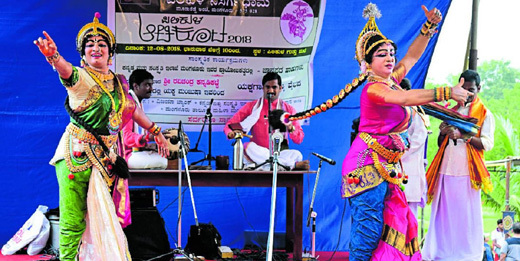 The background artistes included Delantamajalu Subramanya Bhat on the chende , Vinay Acharya Kadaba on the maddale, and Vasant Siddakatte on the chakrataala .This one-hour Yakshagana recital was performed on a makeshift stage erected opposite the Guttu Mane. Following this performance, Mime Ramdas and his team of eight musicians presented Tulu folk songs. Videos on toddy tapping, preparation of traditional palm jaggery and of ‘akkimudi’ presented inside the Guthu House were educative. 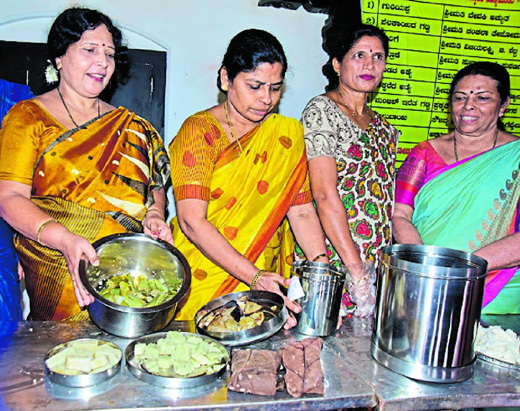 Chanchala Tejomaya and other members of the Mahila Mandaligala Okkoota served special food items including ‘pelatha gatti’, ‘manjal iretha gatti’, and ‘eddemunchida kashaya’ to the visitors. Fooding culture : The visitors also relished the traditional meals served on the occasion, which was of 20 items - ‘ambade uppinakayi’, ‘thimare chutney’, ‘neeru mavinakayi chutney’, ‘mullusouthe pacchodi’, ‘uppad pacchir mattu kadle palya’, ‘sojank mattu halasina beeja upkari’, ‘kanile mattu hesaru gasi’, ‘mette ganji’, ‘patrode’, ‘halasina ele kottige’, ‘harive dantu’, ‘sevu dantu’, ‘heere mattu paduvalakayi sambar’, ‘soute kaihuli’, ‘huruli saaru’, jeegujje podi’, ‘ambade mattu kanchala menaskai’, ‘sevu tetla mattu soute sambar’, halasina hannu appa’ and ‘sarnadye payasa’ along with buttermilk and rice. Yakshagana artistes Vidya Kolyuru, Kannadadikatte and Tejomaya were felicitated on the occasion. V. Prasanna, executive director of the Nisargadhama, said more than 1,000 people participated in the event. Among those in attendance were Inspector-General of Police (Western Range) Arun Chakravarthy and Mangaluru Customs Commissioner M. Subramanyam. The dishes of the south canara are mouth watering it has nutritional value as well.